Flutter Letterpress: Letterpress Week at Oh, Hello, Friend! Letterpress Week at Oh, Hello, Friend! Hello there!! I have to apologize for falling into the dark black hole that is 'no blogging' for the last few weeks. It's been incredible (in a good way!) the amount of orders I've been getting! I know, I know, I'm a bad stationer. I'll be better. What an to know why? I did it. I realized that outsourcing is easier. Perhaps not cheaper, but 100% easier than doing it myself-- and the project I've chosen to revamp is the blog. Yes folks, I know it's been 'redone' a few times already (sorry loyal followers! ), but I've managed to goo this one up to no repair and it must be done. I've contacted a professional to help me. I thought long and hard before deciding to get help-- I was kind of a hypocrite by NOT asking for help. I mean, every day I get requests of brides and stationery lovers for help on their projects because they can't/don't want to do it themselves-- why was I so different? Yeah: I'm not. Anyway- there are lots of new changes to come and i'm trying to hold back the massize amount of blog posts (I can't WAIT to show you some of these invitations and stationery items!) until the site is redone. In the meantime, I want to give you some letterpress goodness to persuse and introduce you (late, of course) to Letterpress Week at Oh, Hello, friend! I just love this blog- it collects the most imspiring elements in the creative world and makes them come alive. I just got our invites, OMG wow! They are so perfect. :o) Thank you for being so amazing to work with, I really appreciate it. P.S. your stationary is absolutely adorable! 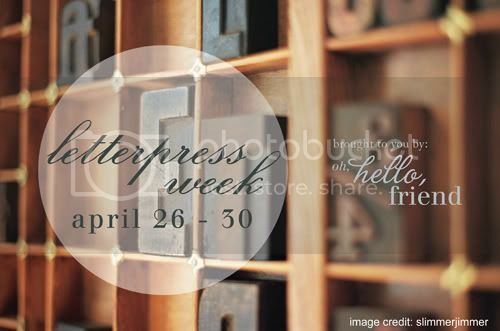 I feel like I did my part for letterpress week....hehehe Love your blog (and new logo) sweet Liz!